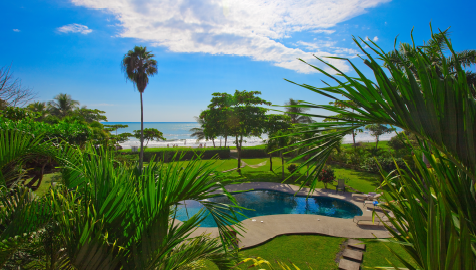 Hotel Casa Azul is a small, private, beachfront hotel on a large property of two and half acres. We offer three hotel rooms on the first floor, a second floor two bedroom luxurious suite, and two casitas, or small houses. Many of our clients will return the following season with friends or family and rent the entire two story building which functions very comfortably as a five bedroom, four bathroom top quality beachfront home. Some of our popular amenities include A/C, ceiling fans, screens, hot water, private bathrooms, lockup boxes, kitchens, private patios and hammocks. New additions to our property include a 2014 beach front yoga, shade and hammock rancho and a 2016 beach front bar restaurant, Blu Bistro. Hotel Casa Azul offers a private, intimate setting with twelve to sixteen guests at a time. From all our rooms (except the small rear room), the suite, the patios, the hammocks, the pool and the casita, you can see and hear the ocean and waves. We offer private beach access, a seductive 50 foot swimming pool and extensive gardens with abundant wildlife. How can I be so confident you will enjoy your stay and receive excellent value for your money? After twelve years in business, these observations stand out. First, every year several of my competing hotel and business owners send their families and friends to stay at Hotel Casa Azul. If you came all this way, wouldn’t you want to stay on the beach too? Secondly, each day there are travelers to our area who arrive without reservations. If they turn right at the crossroads, entering Santa Teresa, the first beachfront hotel they encounter is Hotel Casa Azul. Once they walk the grounds, see the rooms and learn the price, they do one of two things. They decide to stay immediately or politely state they will search for and compare with other accommodations. Those who chose to search, and whose budget falls within our price range, often return, in short order, to stay at Hotel Casa Azul. My final observation.... I often meet tourists, whether it is in the new Belgian bakery in front of our entrance, or in the waves, or on the beach. The conversation often leads to me asking, “where are you staying?” I can’t resist, I have to ask. I know the hotels in my market and I have slept in many of them. If they are staying in a hotel in my price range I will invite them to come see Hotel Casa Azul. © 2019 Hotel Casa Azul. All Rights Reserved.